Rediff.com » News » Check out what India is buying for its defence services! Check out what India is buying for its defence services! IMAGE: The International Fleet Review, February 6, 2016. 'The range of purchases throw a light on India's threat perception as also its perceived role of being a stabilising influence in the region,' says Brigadier S K Chatterji (retd). Defence Minister Manohar Parrikar has cut the Gordian Knot in which defence weapons procurements were hibernating for almost a decade. The range of purchases throw a light on India's threat perception as also its perceived role of being a stabilising influence in the region. The proposed acquisitions encompass the full range of military equipment to include naval, aerial and land based platforms, aided by a satellite programme that aids intelligence acquisition and an Indian GPS capability. In effect, it is a holistic effort covering all fields required to guard its land borders as also project strength, regionally. A deeper study of the proposed acquisitions reinforces such a viewpoint. The major naval assets already ordered or in the pipeline include both sub-surface and surface ships. Indian submarine plans formulated in 1999, cleared the acquisition of 24 submarines over a period of 30 years. Out of these, six were to be Scorpene class, already in service with the navy. The project, being executed by the Mazagaon Docks, is behind schedule by four years. The first of these will join the fleet in 2016. All six should be with the navy by 2020. Six more submarines were cleared by the government in 2015 as part of the P 75I project. Confirmation of the foreign partner for this project is yet to be announced, however, the selection process is apparently in its final stages. In the nuclear class of submarines, India has the Russian Chakra on lease with it. 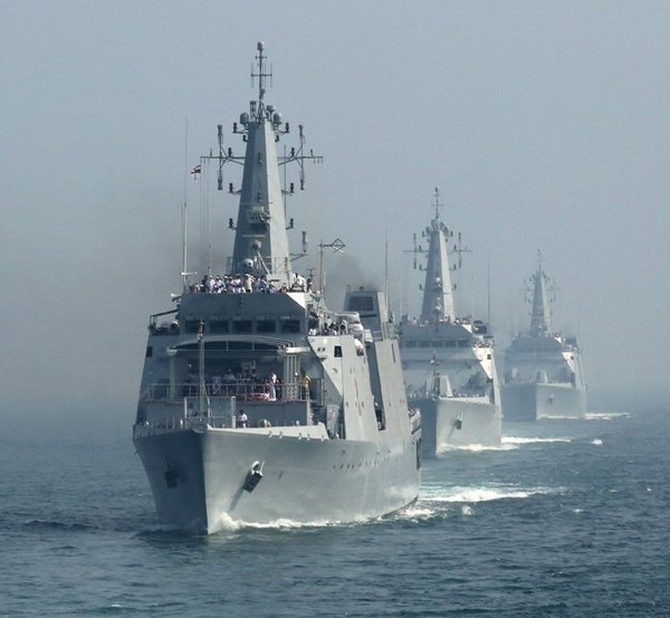 The indigenous Arihant, which also involved the participation of major private sector enterprises like the Larson & Toubro, has completed its sea trials and is scheduled to undertake missile testing. Manufacture of another six nuclear submarines are on the anvil. However, the timelines of production are not yet clear. Meanwhile, another nuclear Russian submarine, unlike Chakra, possibly a new one, is on the cards. In terms of aircraft carriers, it would be interesting to get the global view first. The US has 10, India and Italy have two each, and Brazil, the UK, Russia, Spain, France Thailand and China have one each. Other major economic powers including Japan and Germany have none. Of the two that we have, the INS Virat is being decommissioned, possibly after the International Fleet Review, and we will have only the INS Vikramaditya left. The INS Vikrant is under construction, while the INS Vishal is yet in the planning stages. In terms of surface ships, the Mazagon Docks and Garden Reach Shipbuilders & Engineers have orders for six stealth frigates. The collaborating foreign partner is Fincantieri. Three Kolkata class and four Destroyers, a part of Project 17B, are amongst the other ongoing ones. In all, the navy has close to 50 submarines and ships under construction. A huge bonanza for enhancing naval capabilities with but one big rider. Our dockyards have their capacities fully taken care of. They also have a history of slipping on timelines. There is a crying need for matured private players to be inducted and the entire process made competitive and time sensitive. The Indian Air Force is also on a modernisation trajectory. What is on the anvil immediately is the 36 Rafale deal with the French government. The other order placed is for 120 Light Combat Aircraft -- Tejas, a 4.5 generation product that was flown recently at the Bahrain air show. 100 more LCA Mk 2, to be developed by Hindustan Aeronautics Ltd, are also under consideration with the possibility of the numbers swelling should the IAF so decide. Upgrades of 50 plus Mirages, 60 Jaguars, 60 MIG 29s and 100 SU 30s have either been decided or are in the final stages of negotiations. The IAF has also been delivered three Phalcon Airborne Warning And Control Systems by the Israelis on an IL 76 aircraft, with orders for two more having been placed. A third radar system is to be made by the Defence Research and Development Organisation. The IAF also looks forward to up to 250 to 300 Fifth Generation Fighter Aircraft based on the ongoing advancement in this direction with the Russians. The FGFA is expected to replace the MIG 29 and Su 27 of the Russian Air Force. The inductions will give the IAF an edge in the regional skies. The IAF is also looking at an additional 150 Advanced Medium Combat Aircraft with HAL taking the lead. The IAF has also been trying to procure six Airbus 330 mid-air refuellers to add to the six that it already flies. The case has been with the MoD for long and is definitely a purchase that the MoD will have to give a nod to enhance the IAF's strategic reach. In terms of transport aircraft, the air force has a sanction for 10 C17 Globemaster III. Another seven are on the anvil. This was possibly the biggest deal we signed in the recent past, but for the Rafale fighters that continues to drag without a meeting point on costs. What is also in the news is the amphibious aircraft US2 of Japanese origin. As the Asia-Pacific's leading economies and pivots of stability in a region of disquiet exacerbated by Chinese aggressive postures, an Indo-Japanese high stakes cooperative venture is welcome. In the area of helicopters, India needs to procure light utility, transport and attack helicopters. We have recently contracted for 22 Apache attack and 15 Chinook heavy lift helicopters. These buys will replace the aging MI-35 and MI-26 fleets. The army has posed a requirement of another 39 Apaches for its strike corps. The army and IAF require a total of 440 light, reconnaissance & surveillance helicopters. HAL is in the fray for providing approximately 187 helicopters, while the rest will have to be sourced abroad. In addition, the navy has a requirement of 127, and Coast Guard another 14 light utility helicopters. Also on order are 16 multi-role helicopters from Sikorsky. There is also a need to procure at least 12 VVIP helicopters. Augusta Westland had been shortlisted, but the order was cancelled. Meanwhile, the Russians have agreed to manufacture in India 200 Kamov KA 226T helicopters with HAL as the Indian pivot. Another 200 helicopters could follow. The Indian Army has decided to switch over to 155 mm as its primary calibre for field guns. The total requirement is approximately 2,000 guns to include light howitzers for the mountains; tracked, towed and mounted versions. Of these, so far 124 ultra light howitzers are to be procured from the US. The DRDO has produced the Dhanush 155mm 45 calibre towed gun based on the designs of the Swedish Bofors. For the tracked version, apparently the army has opted for the K9 Howitzer developed by L&T-Samsung. Orders for 100 guns at a cost of Rs 4,000 crore (Rs 40 billion) are likely to be placed shortly. Even after that, the MoD needs to source over 1,500 guns of 155 mm calibre. The Air Defence Artillery's equipment status is alarming. However, the talk of importing up to six Russian S 400 Triumph systems is most heartening. The requirement is far more and includes all varieties like guns, shoulder fired missiles and surface to air missiles. The induction of the DRDO produced Akash has been the only silver lining on a rather disparaging cloud. The much touted Future Infantry Soldier as a System (F-INSAS) program has not even got to trot as yet. Even the bulletproof jackets and helmets are yet to be procured. The F-INSAS is dependent on networked communication systems being fully in place. Only then can situational awareness of the infantry soldier be enhanced. Currently, the Tactical Communication System is yet to be fully fielded. The immediate requirement is to improve the infantry soldier's protective gear, providing quality personal load carrying equipment and a far better uniform that is more durable and is also nuclear and chemical resistant. Add to it, a good personal rifle and sten machine carbine and better night vision equipment. The basic tank that we have is the Russian origin T90s, a third generation Russian origin platform. By 2020 India should be able to field up to 40 tank regiments equipped with the T90. The rest of our tanks are primarily the older T-72. These are being upgraded with better night vision devices. Orders have been placed for 124 Arjun tanks. The Arjun Mk II is being progressed with 70 modifications to be incorporated. As far as the global industry players are considered, the sheer scope of contracts to come is a fabulous opportunity. View it in the context of Prime Minister Narendra Modi's Make in India call and a new defence procurement procedure in the offing that promises a level playing field at par with OEMs, and a great opportunity awaits the Indian defence industry. Make in India's commitment to job creation can only be met should we look after the interests of micro, small and medium players in the sector. India also needs to fund indigenous design, development and research on its shores. This great opportunity to develop the complete eco-system for the Indian defence industry would otherwise turn out to be a lost opportunity. Also, sovereign decision making in geopolitical terms requires the capability to extend and sustain military might based on domestic capabilities, primarily.